SANTA CLARA, Calif. -- In the hours after he was released by the Seattle Seahawks, the only NFL team he'd ever known, cornerback Richard Sherman declared that one of his top priorities for his next stop would be to play for a contending team. Little more than one day later, Sherman agreed to a three-year deal with the San Francisco 49ers. It's a deal that could be worth up to $39 million, according to ESPN's Josina Anderson. 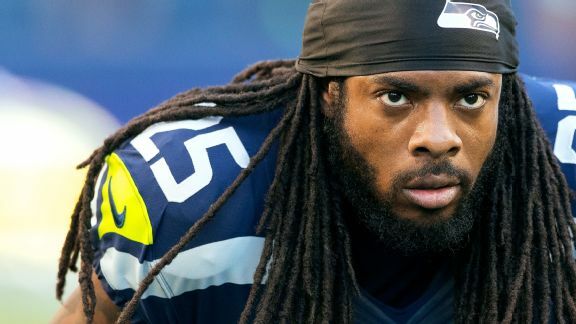 It's also a deal with the very same Niners whom Sherman tormented for most of his seven seasons in Seattle, particularly from 2011 to '13, when San Francisco and Seattle were the undisputed heavyweights of the NFC. These are also the same 49ers who one year ago were about to embark on their first free-agent period under coach Kyle Shanahan and general manager John Lynch. At the time, the Niners were simply looking for a way to dig out of the giant hole left by instability at head coach and years of poor drafts and roster decisions. Those Niners were coming off a three-year stretch in which they'd won a total of 15 games. Suffice to say, Shanahan and Lynch had what looked like a long rebuild ahead of them. One year later, Shanahan and Lynch landed Sherman, one of the league's most accomplished cornerbacks, albeit one coming off a serious Achilles injury and a surgery on his other Achilles, before the free-agent period has even begun. It's a move they almost certainly wouldn't have made a year ago and one that sends this unmistakable message: The 49ers believe they are ready to be a legitimate contender once again, starting right now. Why else would they be willing to take a leap of faith on a veteran corner who will turn 30 at the end of this month? Sure, they had a desperate need at cornerback, but if they wanted to play the long game, they could have waited a few days and chased after someone such as Malcolm Butler or Trumaine Johnson, or even tried to pry Kyle Fuller loose from his transition tag with the Chicago Bears. All of those moves would have been reasonable and could have been explained as helping the Niners now with an eye toward the future. Instead, the 49ers went after Sherman, the player who checks every box in what defensive coordinator Robert Saleh wants in a cornerback in his Cover 3 scheme. They were willing to roll the dice -- and make no mistake, there is risk here, since nobody knows how Sherman will bounce back from his Achilles injury -- because they believe Sherman can make an immediate and significant impact. This is the type of move a team makes when it believes it's only a few pieces away from contending for Super Bowls. So, how did the 49ers go from a team signing players Shanahan knew and trusted -- like Pierre Garcon, Brian Hoyer and Aldrick Robinson -- and taking a flier on players who might have underperformed elsewhere -- such as Marquise Goodwin and K'Waun Williams -- to chasing after and landing one of the league's most well-known and established stars? Well, like most things that have happened for the Niners in the past five months, this can be traced back to their acquisition of quarterback Jimmy Garoppolo. After the Niners started the season 1-10, Garoppolo stepped into the starting lineup and promptly led the moribund franchise to five consecutive victories while piling up some eye-popping numbers along the way. Garoppolo's performance made the Niners better in almost every statistical category over the season's final five weeks. Suddenly, a team that seemed lost in the woods had its long-missing franchise quarterback, and even with a record of just 6-10, had running back Carlos Hyde openly talking about potential Super Bowl runs in 2018. That momentum only picked up when the Niners signed Garoppolo to a record-setting five-year, $137.5 million deal on Feb. 9. On the day the team held the news conference to discuss Garoppolo's signing, Lynch made it abundantly clear that the Niners view their franchise quarterback as a selling point. "For us, heading into free agency, this is a big deal," Lynch said then. "It's 75 degrees and sunny outside, we've got [Garoppolo] -- who wouldn't want to be here? We want to become a destination where everyone wants to be." For Sherman, though, there was no need to sell him on the weather or the Bay Area as a place to live. After all, he spent his college years at nearby Stanford, just up the street from Levi's Stadium. The same can be said for how he would fit in the 49ers' Cover 3 defense given his ties to Saleh from their time together in Seattle. If the Niners were to land Sherman, the question was whether they fit his criteria as a contender. To be sure, the 49ers have a long way to go to prove that they are. Such things can be shown only on the field this fall. But a little more than 24 hours after he became a free agent for the first time in his career, Sherman offered his own resounding answer to that question. That the 49ers believed they were such a good match for Sherman tells you they view themselves the same way.